Available now and one of your last chances for a new home in Harrison Ranch! 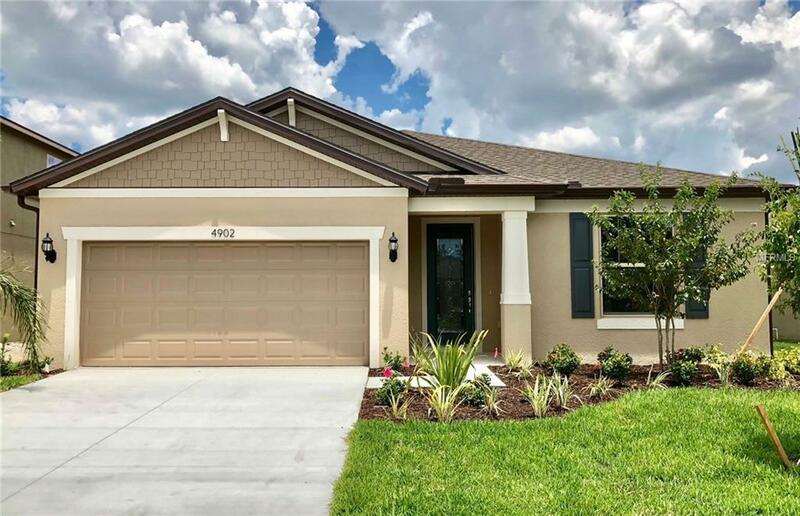 This popular 4 bedroom Oasis floorplan is one that is truly hard to beat. The grand entrance is a show stopper, with 94 ceilings, 8-foot frosted glass door. This open kitchen concept is furnished with a large island, and enough space to hold all your kitchen gadgets. You wont feel lonely in this kitchen, it overlooks the dining room and living room, which overlooks the covered lanai. Sitting at the island is the perfect spot to view the entire home. The master bedroom is situated away from the guest room, complete with a walk-in closet and a walk-in shower and tub in the master bath. The home is complete with stainless steel microwave, dishwasher and oven, spacious laundry room, drop zone space, espresso cabinets, beautiful granite and tile throughout the home. This home is located behind the gates of Normande East, complete with a private community pool. Harrison Ranch is also furnished with a state of the art Community Center that has a Lifestyle Director to plan the perfect events, 24-hour gym, tennis courts and pickleball courts, softball field, soccer field, junior size heated Olympic swimming pool, and 5.5 miles of beautiful walking trails, known as the hidden gem of Harrison Ranch. The perfect Oasis to call home.